Our Loan Amortization software is designed to easily provide the C.P.A., small business owner, or individual with a loan amortization schedule showing interest and payment totals. Auto loans, mortgage calculations, and lease payments can be calculated with ease. Payments can be calculated for either annual, semi-annual, quarterly, bi-monthly, monthly, semi-monthly, bi-weekly, or weekly payments. The software will calculate either the principal, interest rate, number of payments, payment amount, or a balloon payment. The loan amortization schedule can be printed in detail or in annual summaries for any chosen year end. 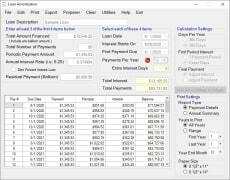 Our loan amortization software will also calculate payments for TRAC leases with residual values and will calculate balloon payments. Interest calculations can be based on either 360 days for equal monthly interest amounts or 365 days per year for exact monthly interest amounts. 1, 2, 4, 6, 12, 24, 26, or 52 payments per year. Variable first payment date with interest from date of loan or interest for a 1 month period. Enter the principal amount, interest rate, payment amount, and number of payments and our software will calculate a balloon balance. Balloon payment / TRAC lease residual payment amount. Choose either a fixed final payment amount with an interest adjustment or a variable final payment with exact interest. Amortization schedules can be printed with detailed amounts or with just annual summaries. Print a complete schedule for all years or a partial schedule for the number of years desired. By choosing the appropriate year end month, schedules with annual totals can be printed for any fiscal year end month. Export the amortization schedule to an Excel® spreadsheet or to a csv data file for use in other programs. Create pdf file directly from within the program. NEW FEATURE - Allows entry of preparer name, address, telephone for printing on amortization schedules.